I wasn’t sure whether to include this one from the first session, since I use this song three times in the series, and this wasn’t the best version of the two without effects. But I decided that this series is about demonstrating the sound and the rhythms, not demonstrating different songs, and using the same song means a clearer comparison of some things. In this case, the sound of the dulcimer also means how you record it, and this session was recorded using a large diaphram overhead mic as well as the camera mic, so the acoustic sounds come through. You can hear the hammers hitting the strings. As well as the rain dripping on the eaves of the windows. For these videos, except this one and the white felt demo, I used only the camera mic. It is a professional video camera with a great mic of course, and gives a standard control for that variable. And that is a huge variable. In the studio and on stage, I have used a variety of microphones along with the wound pickups and piezo contact pickups. Each one or combination creates a different sound. In the studio I usually record with several different mics and pick-ups on seperate tracks so I can mix the tone I want for that song. Or chose a ceran combination for the tone of the entire album. I didn’t demonstrate that here, as it would have involved hooking up a lot more gear. Also, the wound pickups really have replaced most everything else I use, practically, unless I want to add that acoustic sound of the hammers and strings to the mix. And the instrument does often bleed into the vocal mic, just like a guitar can, and maybe more, since it is louder than a guitar and oriented up towards the vocals, not out, and my head is closer to it. Still, this is another subject all together, but wanted to at least include some small part of that in this series. It also shows a little of how a song can vary, from one day to the next. 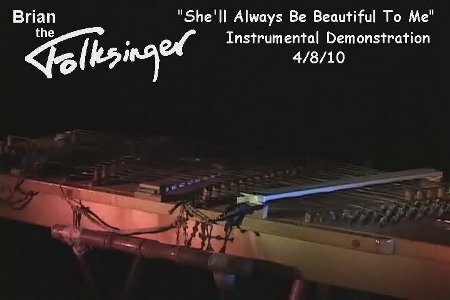 Though I have played this song for years, I am still always improvising to a degree, doing one variation or another, one version or another. In someways I a trying to do a spefically instrumental version of the song, embelishing the normal rather melodic, jazzy rhythm part into a instrumental version. This entry was posted on Wednesday, April 28th, 2010 at 5:11 am	and is filed under The Electric Hammered Dulcimer. You can follow any responses to this entry through the RSS 2.0 feed. Both comments and pings are currently closed.